Antechinus stuartii (Macleay, 1841), Manly, New South Wales, Australia. 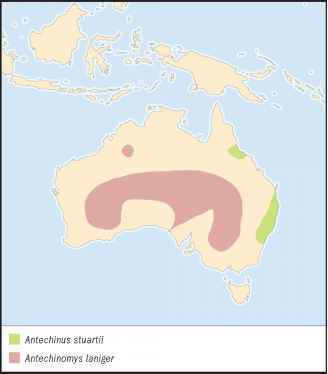 Two subspecies described. Length 2.9-5.5 in (74-140 mm). Uniform grayish brown; paler below, with thin, hairy tail almost body length; broad head with pale fur around eye. Australian east coast and hinterland from southeast Queensland to southern New South Wales. Wet to dry forests with dense ground cover and numerous logs. 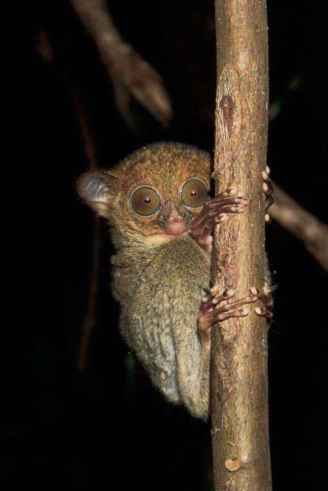 Nocturnal, but may be active during day if food scarce. Terrestrial; partly arboreal if sparse groundcover or larger terrestrial competitor present. Lives up to five or six years in the wild. Up to four young from ages two to six. Probably promiscuous. Small to large insects, beetles, and spiders. Tightly synchronized mating season (two weeks). Semelparous with abrupt male die-off immediately after mating season. Probably promiscuous.